Cubicle dwellers and business travelers know well the hazards of noise pollution. Poor office acoustics and boisterous airport terminals drive one to distraction and drain productivity. Ever try to work in an airport lounge? Might as well set up a desk on the tarmac. And back at the office, if it isn’t the fax machine ringing incessantly, it’s the co-worker who… just… won’t… shut…up. You could spend up to $150 on one of those white noise machines—or, rather (ahem) a “deluxe sound therapy conditioner system”—built to reduce distracting noises, relieve tinnitus and raise your consciousness. Or you could invest in a half-decent set of noise-canceling headphones and spend 99 cents to download a white noise-style app. Your choice. Just remember, the white noise machine can’t make phone calls or send tweets to your Twitter feed. Make It Rain: Ambiance lets you choose from more than 40 ambient noises, including several variations of rainfall. Ambiance creates clever distractions from distraction. The developer describes the app as an “environment enhancer,” but it’s really a souped-up white noise machine with a whole spectrum of colors—blue, brown, pink, and violet, as a matter of fact. 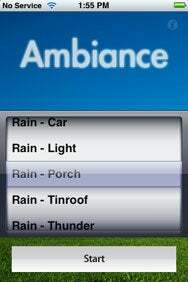 Ambiance gives users more than 40 ambient noises to choose from. (There are so many choices, in fact, that the user may actually become less productive by sampling them all.) Does the sound of rain put you in the proper working frame of mind? Ambiance offers light rain, rain on a car windshield—the rhythm of the wipers blades is quite hypnotic—rain on a porch, rain reverberating off a tin roof, rain and thunder, rain and wind. Prefer your wind without rain? Ambiance gives you the option of high wind or haunting wind. As for me, I wrote this review in a thunderstorm. Ambiance operates simply, with a clean, stylish interface. Users simply scroll through the dial to the sound they wish to hear and click the “start” button. But as apps go, Ambiance is enormous—a 144MB monster. The application allows users to reduce the size by deleting sounds, however. Ambiance also includes a battery-saving timer and an alarm, in case you want to use the program as a relaxation aid rather than a productivity enhancer. Ambiance may have some competition with aSleep, which is similar in concept and design. Ambiance is being sold as a productivity tool, while aSleep is a health and fitness product. The difference is neither one of degree nor of kind, but of marketing. And interface—aSleep looks more cluttered and less seamless than Ambiance. Like Ambiance, aSleep has a timer (but no alarm). Unlike Ambiance, however, aSleep requires the user to stop and start between sounds. With Ambiance, you merely scroll up or down to the next sound, if you like. 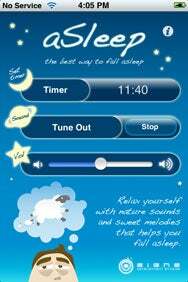 You Are Getting Sleepy: Though it’s billed as a sleep aid, aSleep also serves as a productivity tool for iPhone users who find that ambient noise helps them concentrate. Some users may find aSleep’s rainfall to be more realistic-sounding than Ambiance’s, or vice versa. If that level of sonic detail is important to you, then either application will be more of a distraction than an aid. Another notable difference: aSleep offers more in the way of synthesized musical sounds, where Ambiance sticks with ambient noises. An endless synthesizer loop may put some people in a peaceful frame of mind, but I couldn’t listen for more than 30 seconds before switching back to rain with thunder. Now if only somebody would develop an app that could amplify total silence. That would be priceless. Until then, Ambiance and aSleep will do just fine at 99 cents. Both applications in this review are compatible with any iPhone or iPod touch running the iPhone 2.0 software update. Updated at 3:25 p.m. PT to remove an incorrect reference to whale sounds. Only Ambiance features a whale sound.